The Taste of Sand Mountain promises to be just that, a taste of numerous top restaurants from all over Marshall County. The event is scheduled for Tuesday, April 30th from 6:00 pm to 8:00 pm. The venue for the Taste will be down Main Street in downtown Boaz, AL with weather permitting. In the case of inclement weather, it will be held at The Event Center on Elizabeth, 201 Elizabeth St, Boaz, AL 35957. There will be music, food and drink samples. Tickets are $20 per plate and we encourage every ticket holder to vote for their best taste of the evening at the Chamber booth. 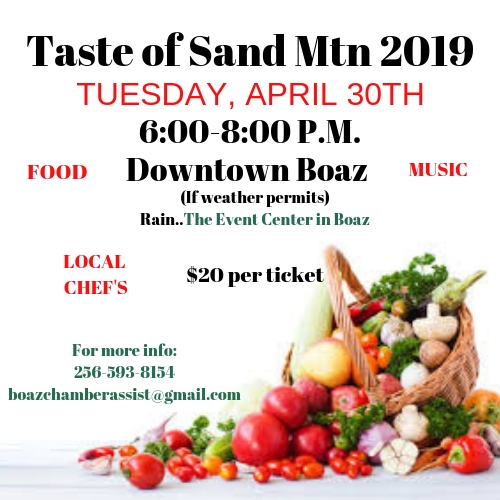 The three top restaurants will be awarded a trophy and honor of holding the title as the best Taste of Sand Mountain for 2019. The best booth presentation and best dessert will also receive awards. If you need more info or would like to purchase tickets, REGISTER FOR TICKETS HERE or contact the Boaz Area Chamber of Commerce at: 256-593-8154 or email:boazchamberassist@gmail.com. In the case of inclement weather, it will be held at The Event Center on Elizabeth, 201 Elizabeth St, Boaz, AL 35957.